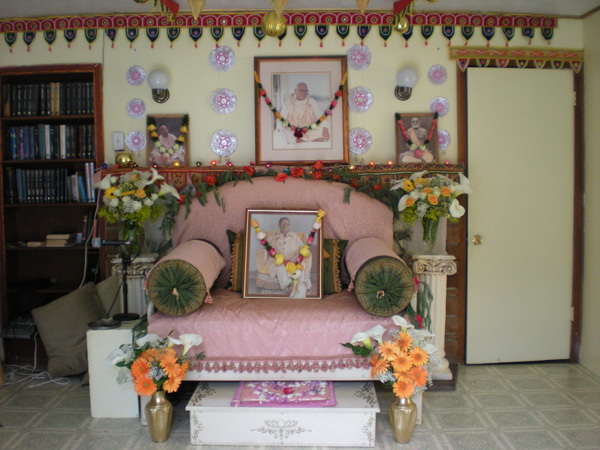 "In the absence of my Gurudeva, Govardhana hill, the representation of Krishna Himself, seems to me just like a big python coming to devour me. 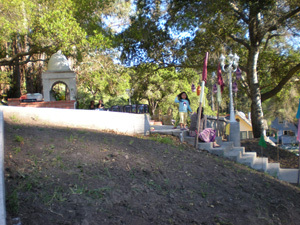 And Radha-kunda, the holiest place of divinity of the Gaudiya-sampradaya, seems like a tiger's mouth coming to devour me. 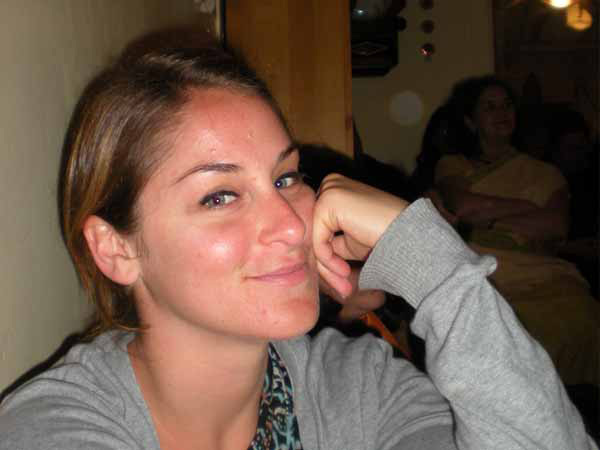 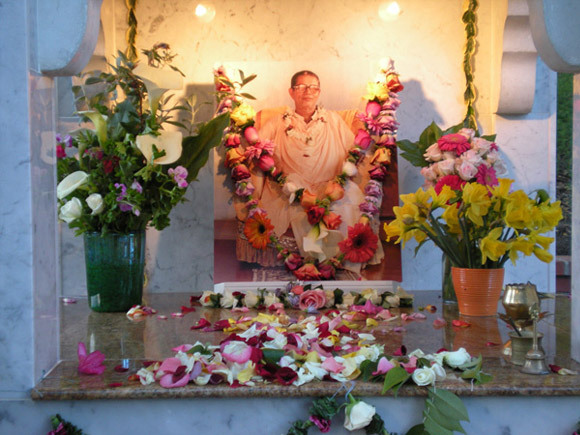 They are giving me so much excitement in the absence of my Gurudeva, my dearest and highest spiritual guardian. My Gurudeva, who has the most intense affection for me, is not here? 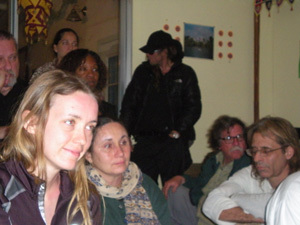 How can it be? Everything is void. All has vanished with his departure." Such a deep sense of separation will come in the heart of a sincere disciple. 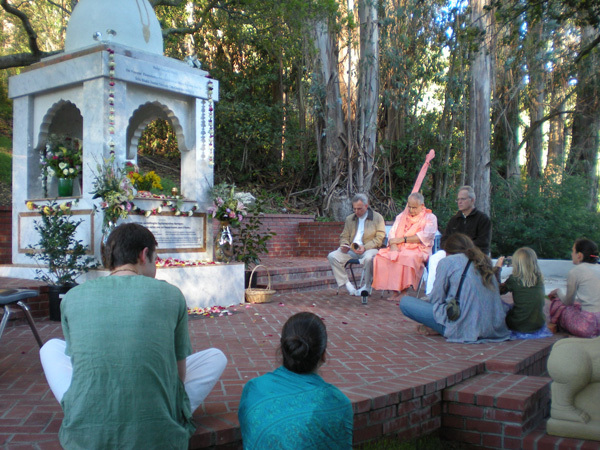 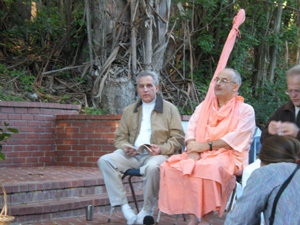 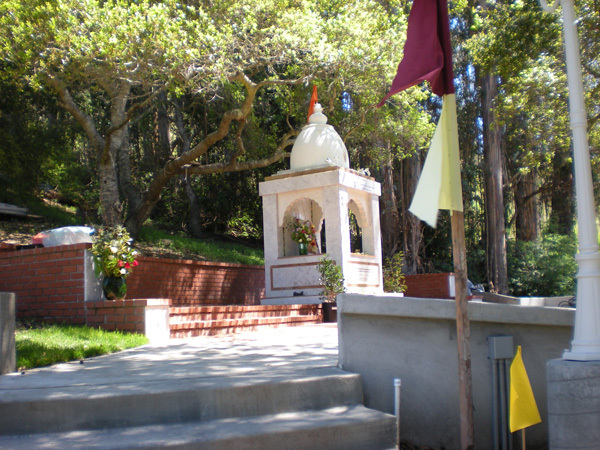 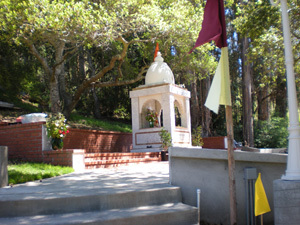 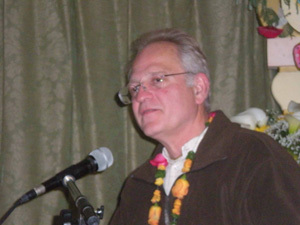 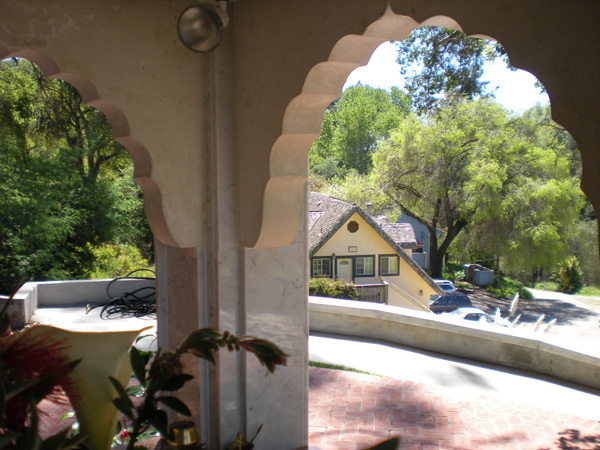 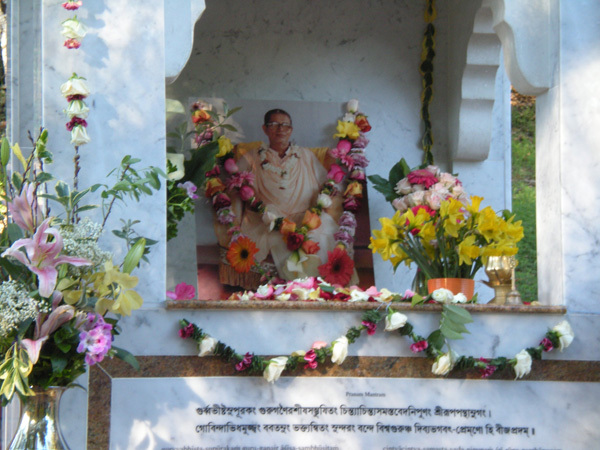 Once, one of your devotees said in his lecture that separation is the highest realization. 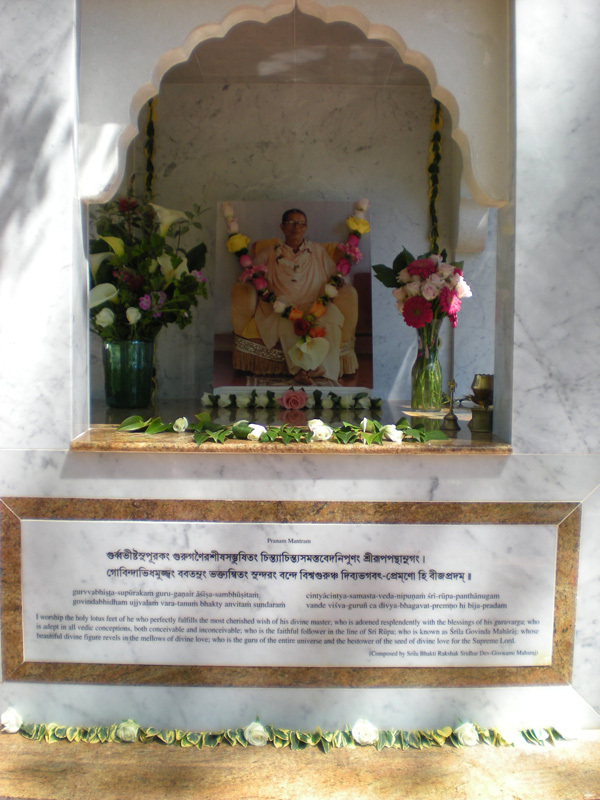 I was very happy to hear from his lips that separation (vipralambha) is the highest attainment. Without separation, nothing else can come to us. 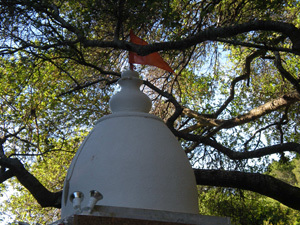 The anticipation of meeting Krishna will appear to us as vipralambha, so vipralambha is the most auspicious thing pertaining to Krishna consciousness. 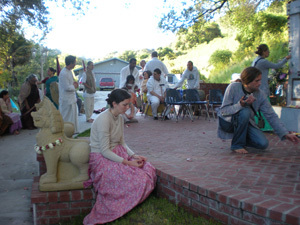 And we can have Krishna's connection also in that separation. 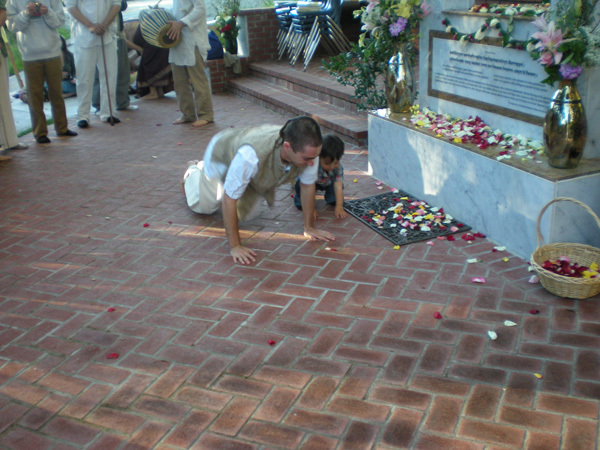 So, the safest and most fearless position is vipralambha. 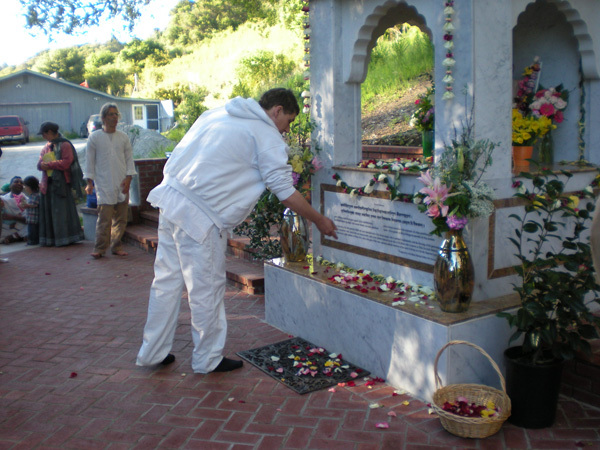 If we can stand firm and retain the memory of Gurudeva in his separation, then we will have passed the highest test. 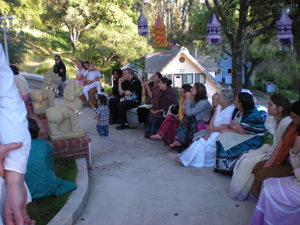 From Srila Gurudev's Pushpa Samadhi Mandhir you can see all the activity going on at the ashram. 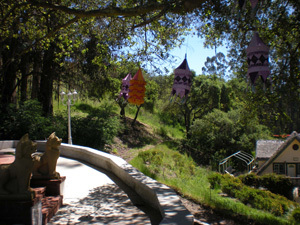 The day dawned with beautiful weather, warm sunshine and soft breezes. 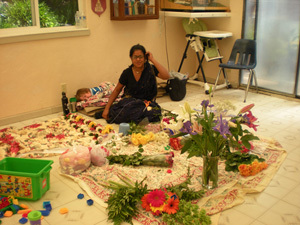 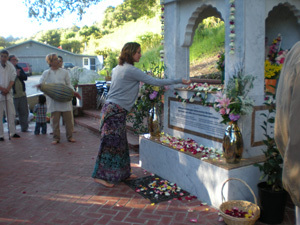 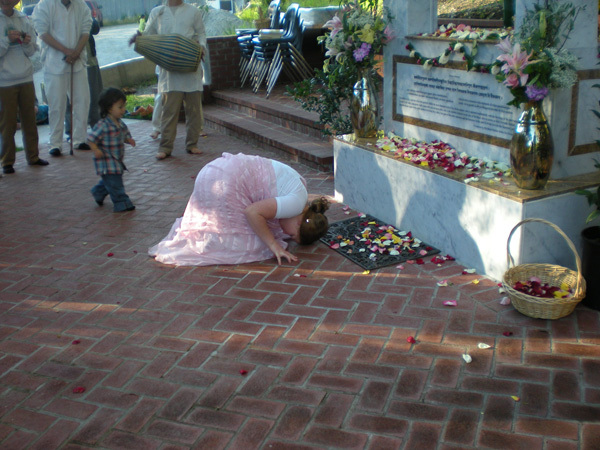 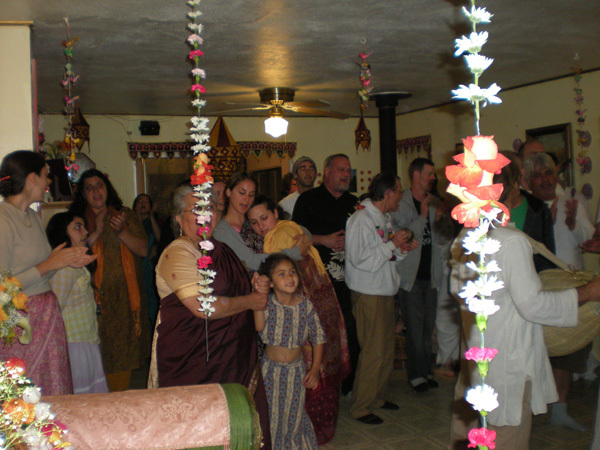 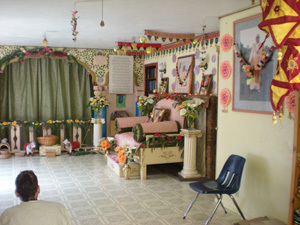 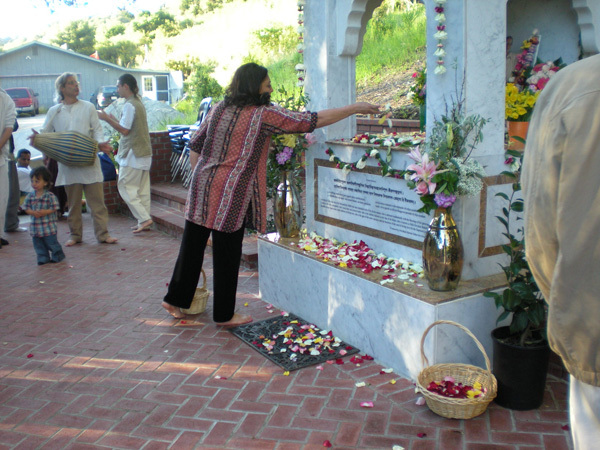 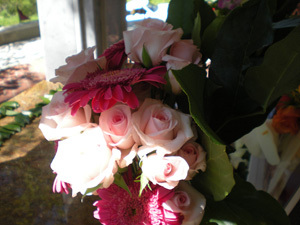 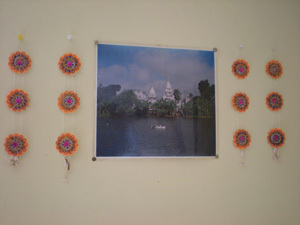 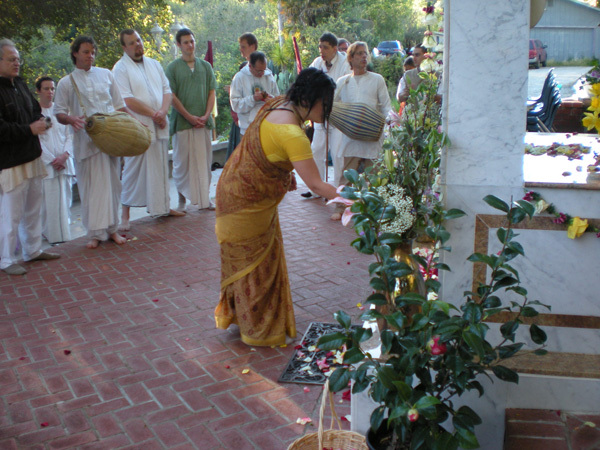 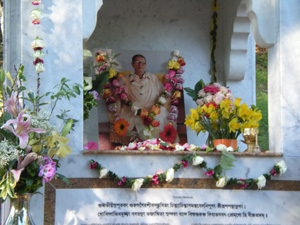 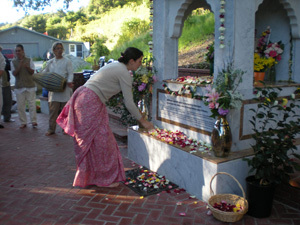 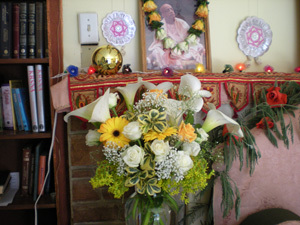 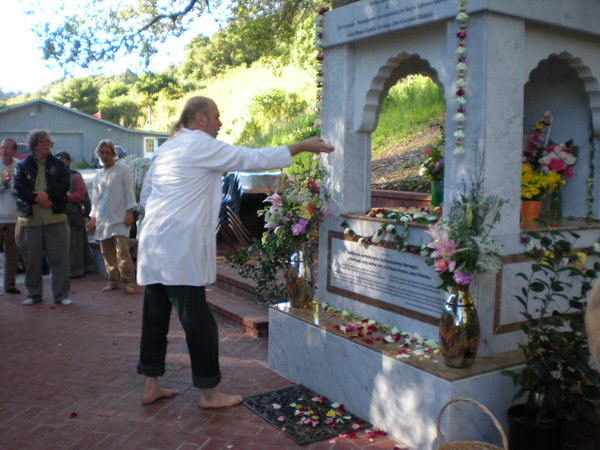 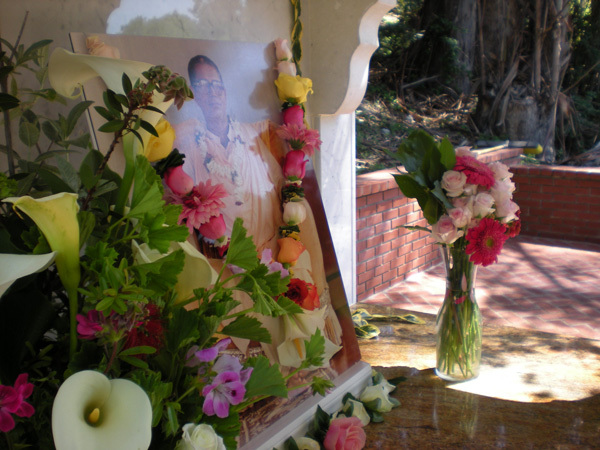 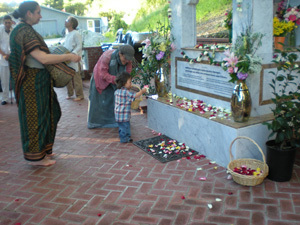 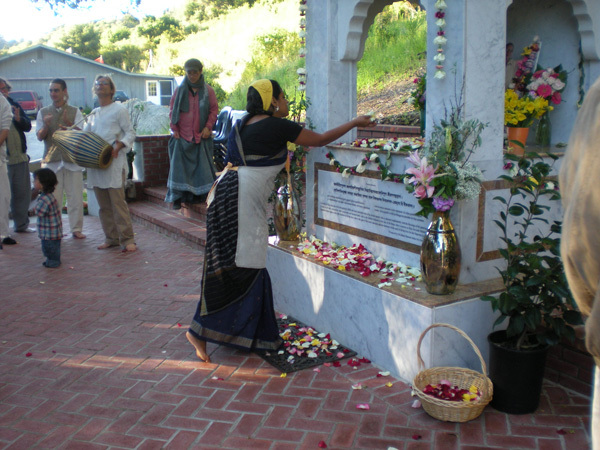 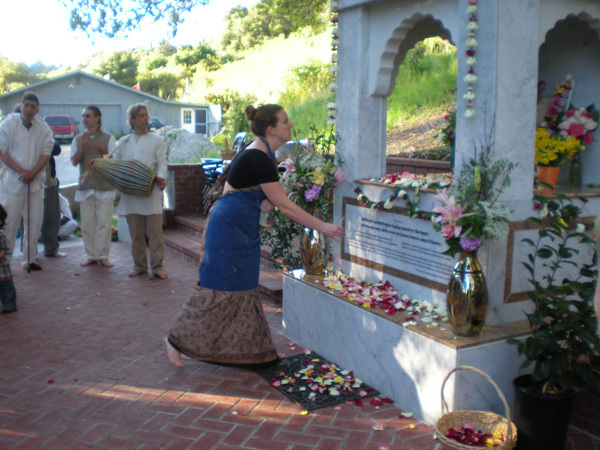 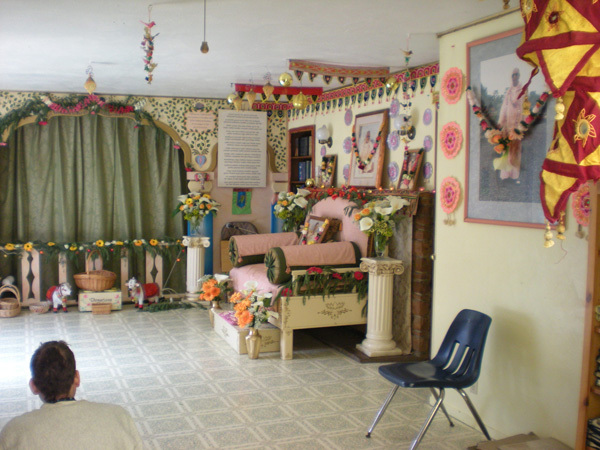 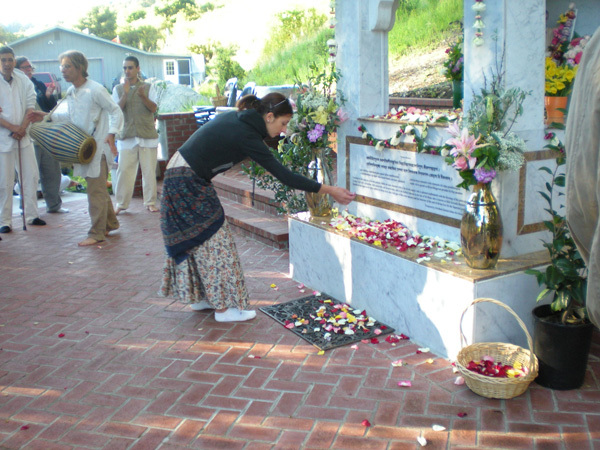 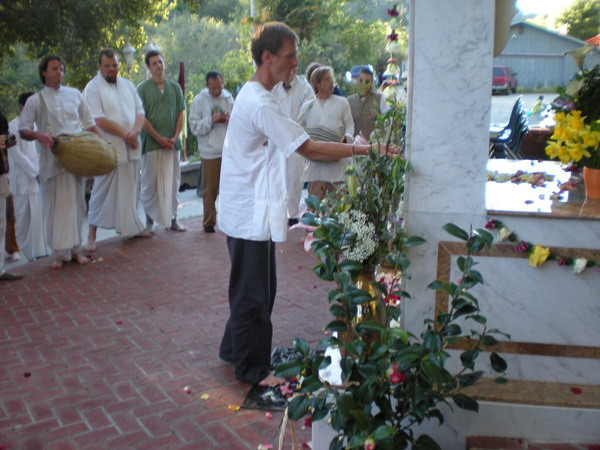 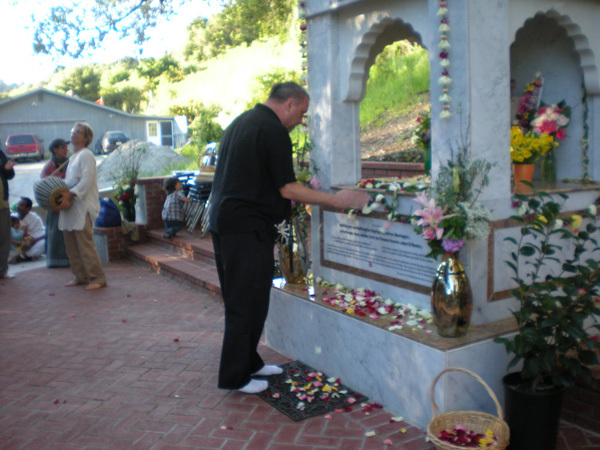 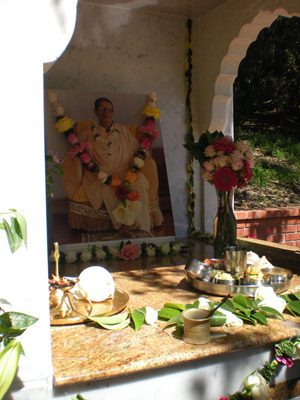 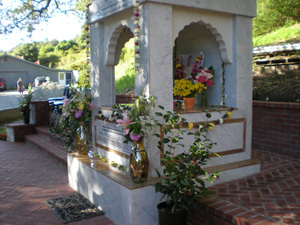 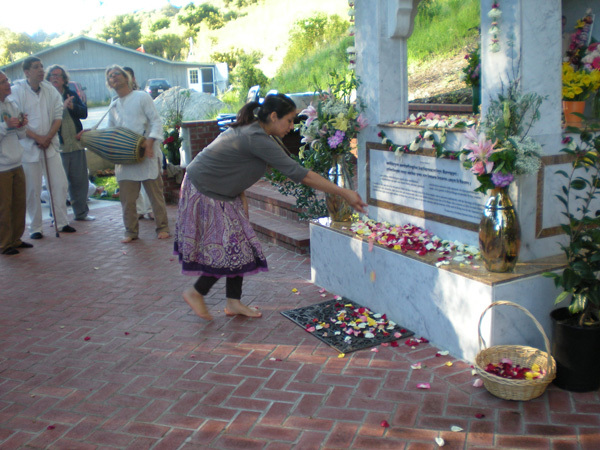 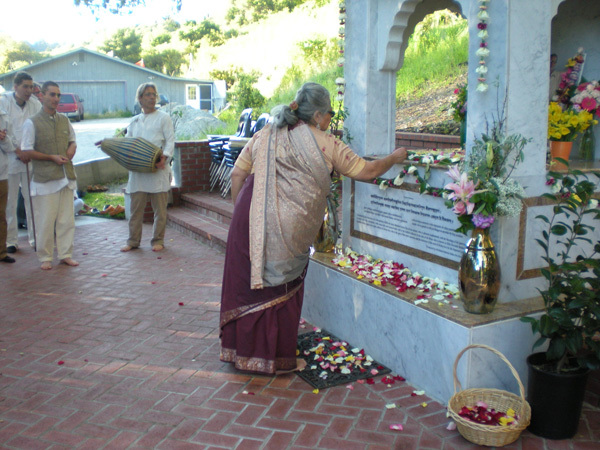 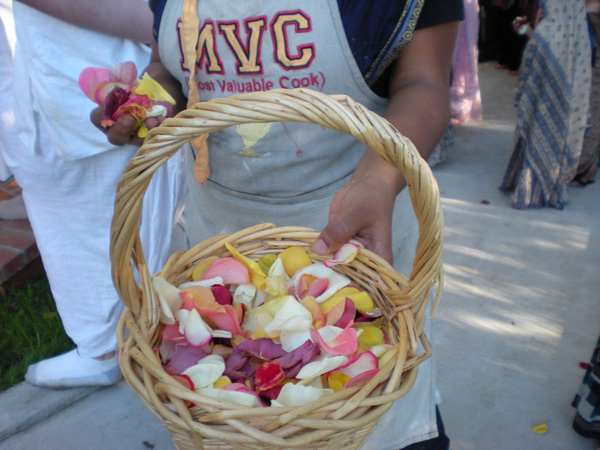 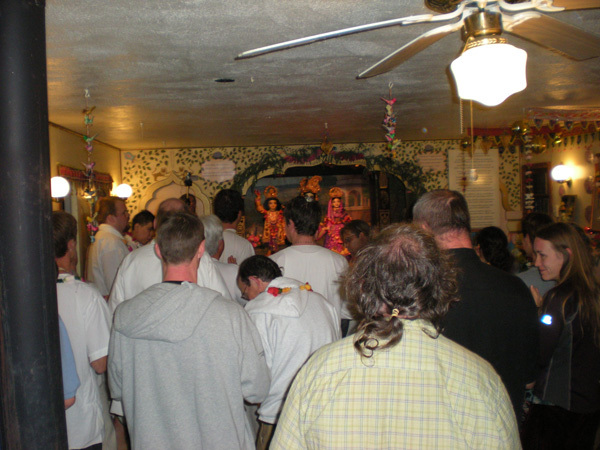 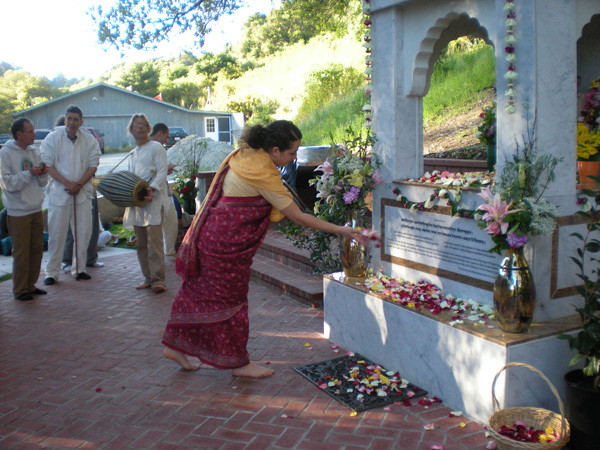 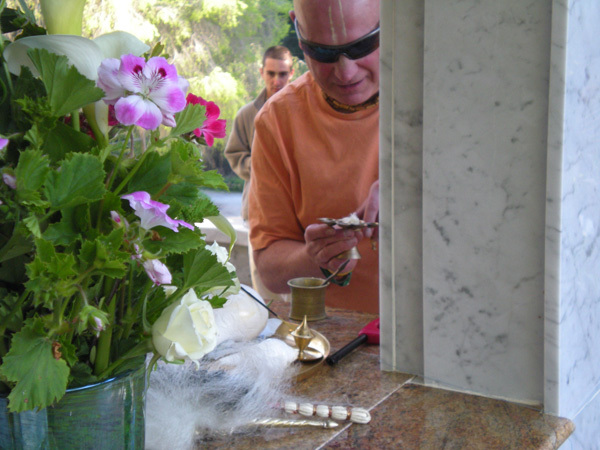 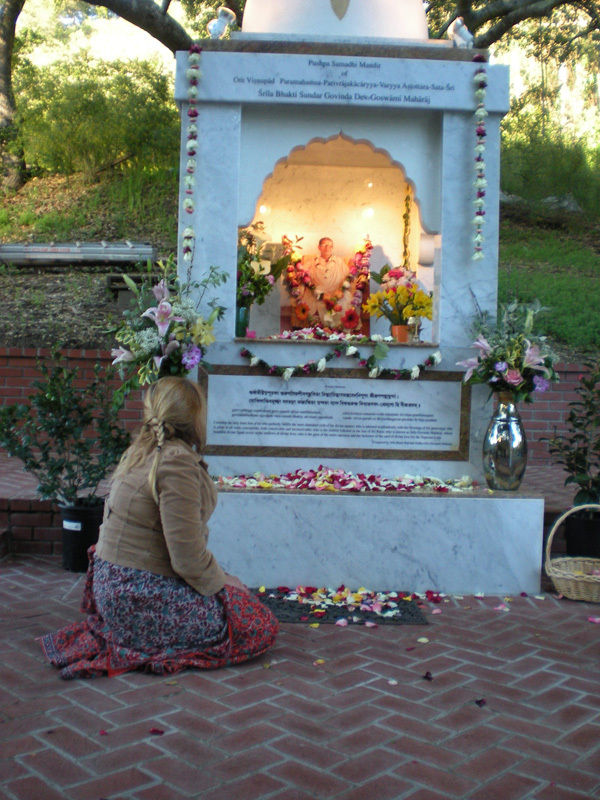 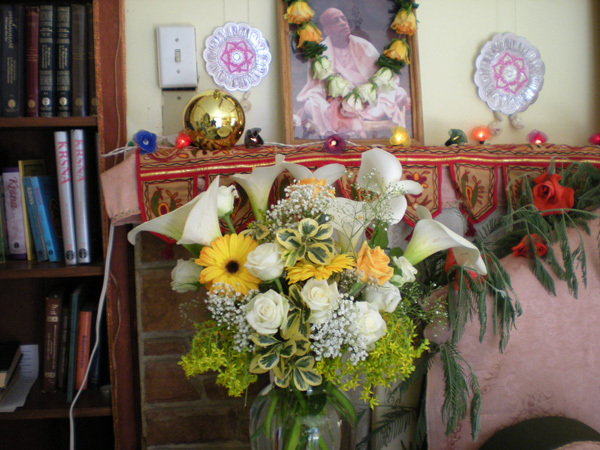 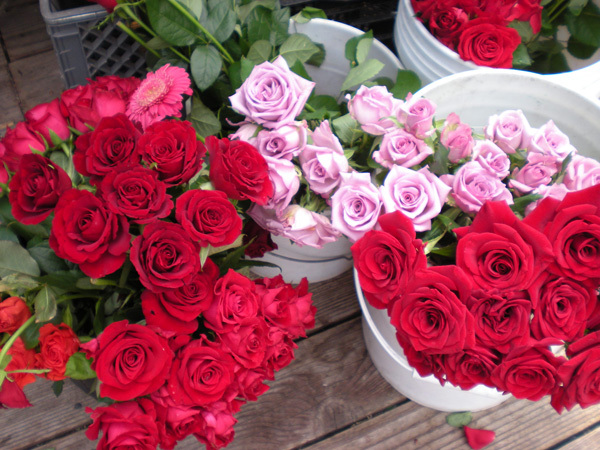 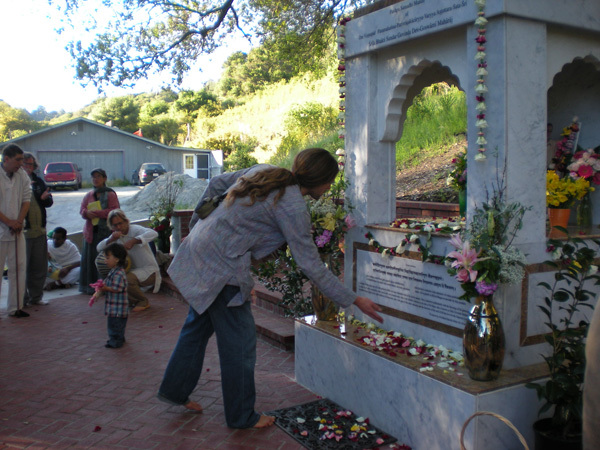 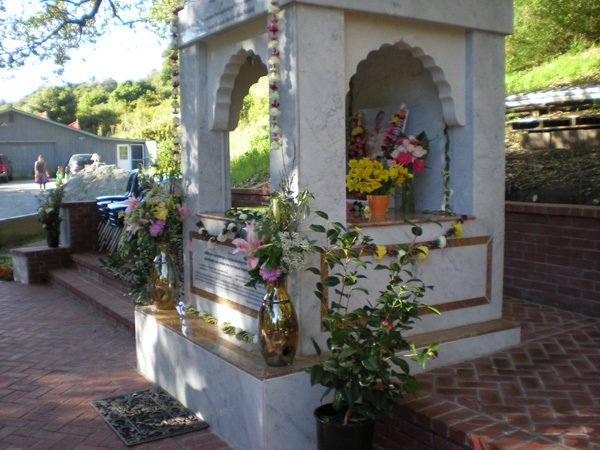 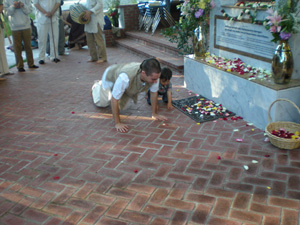 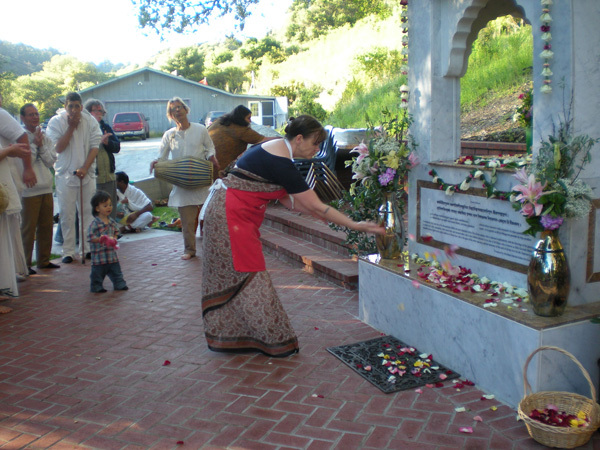 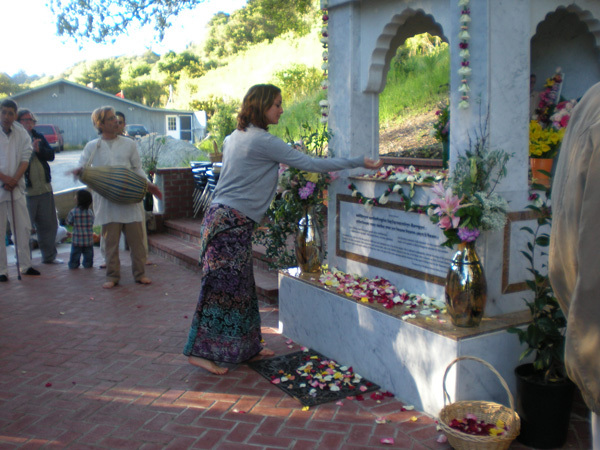 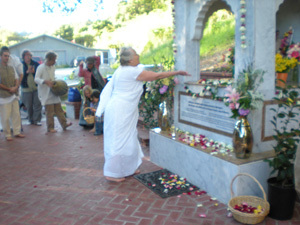 With the devotees donations many flowers were bought to adorn the Samadhi Mandhir and the Temple Room. 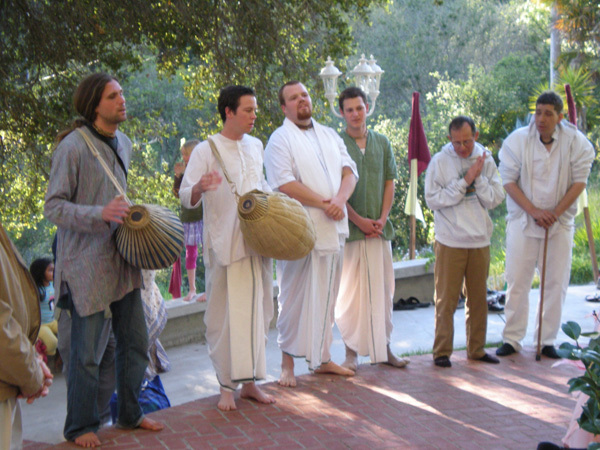 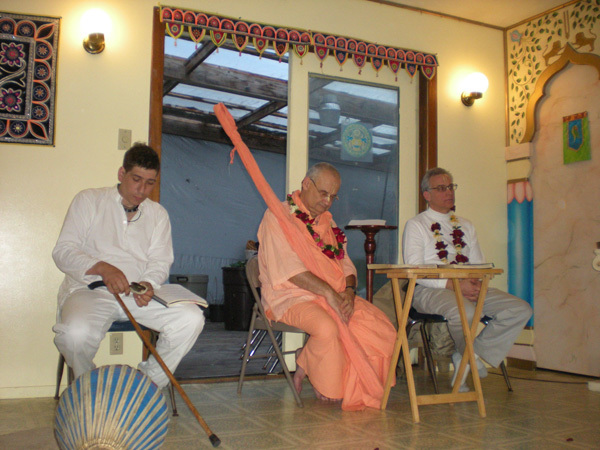 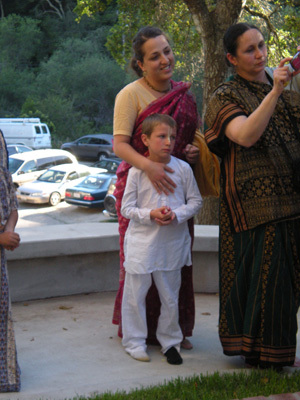 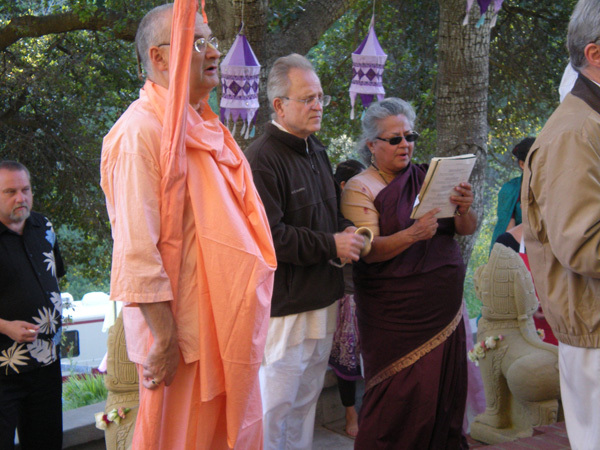 Ajita Krishna Prabhu drove down from Northern California and arrived in time to join Ramai Prabhu in singing the Bhoga Arotik song for Their Lordships. 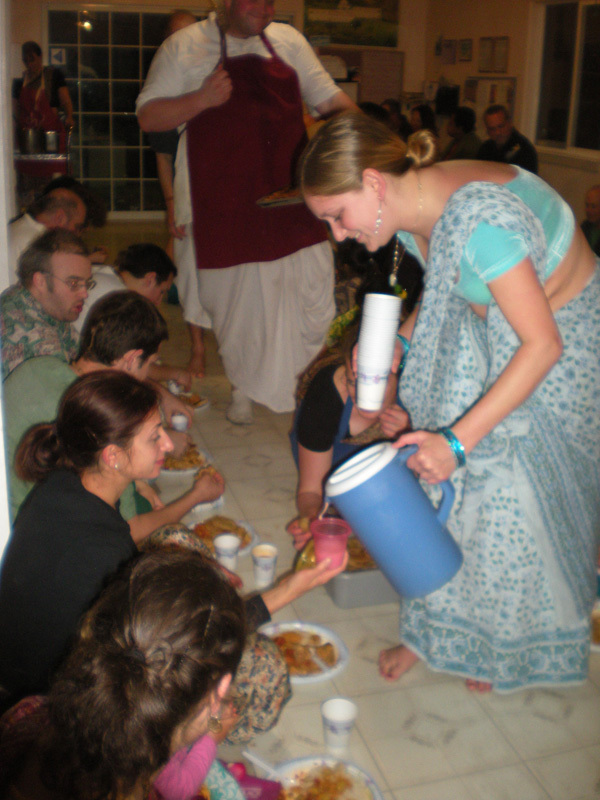 Arindam Krishna Prabhu was assisted with cooking the noon offering by Bilva Managal Prabhu just returned from Sri Navadwip Dham. 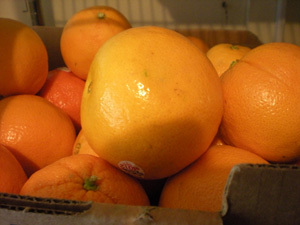 Plentiful donations of fruit and vegetables. 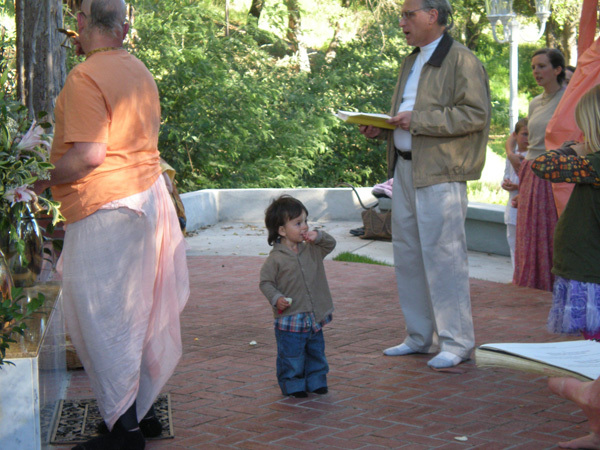 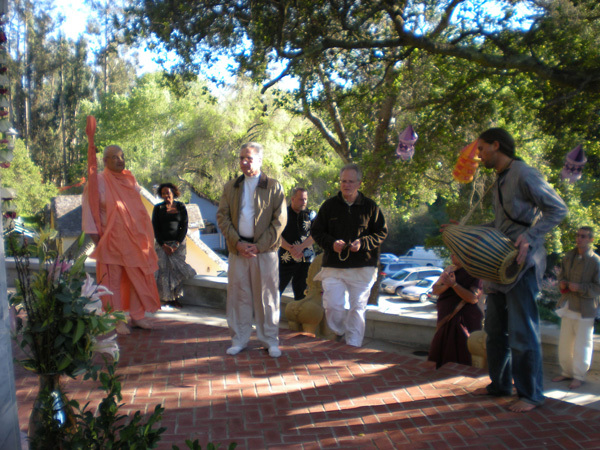 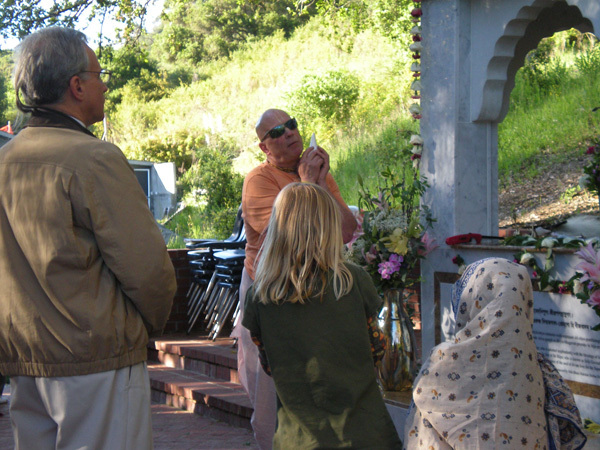 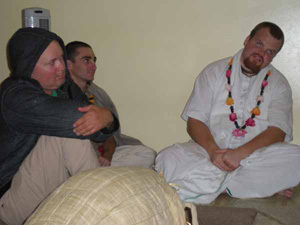 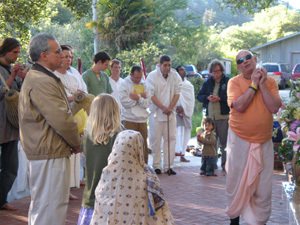 Uncle Shatrughna Prabhu and young Madav visit the Samadhi Mandir upon arriving at the Ashram. 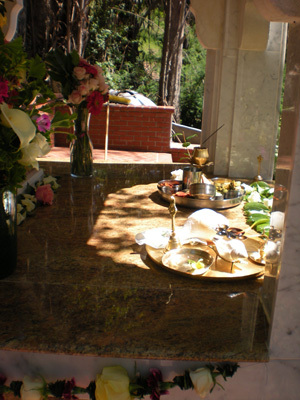 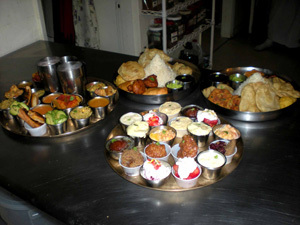 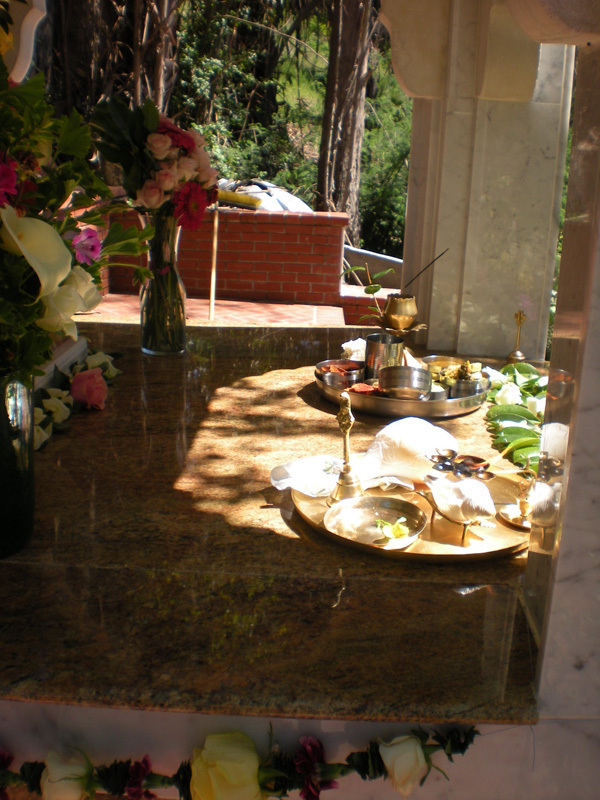 Srila Gurudev's Lunch offering and arotik tray. Srila Gurudev told Srila Janardan Maharaj that he would sit on the tree where the children would play and see what we offer him. 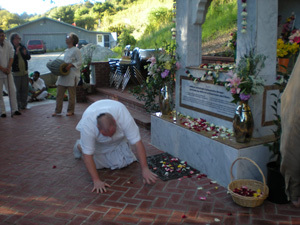 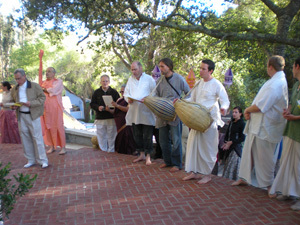 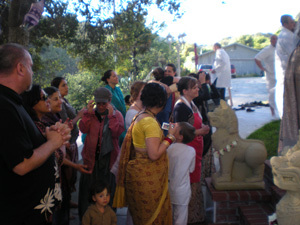 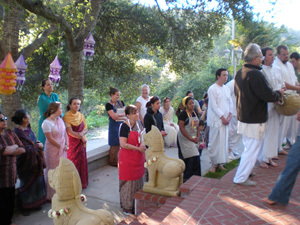 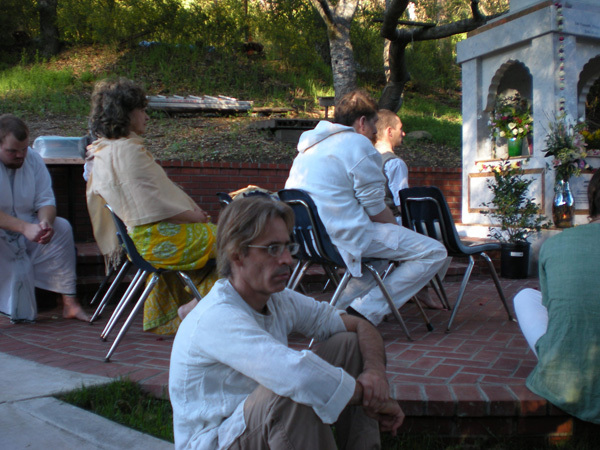 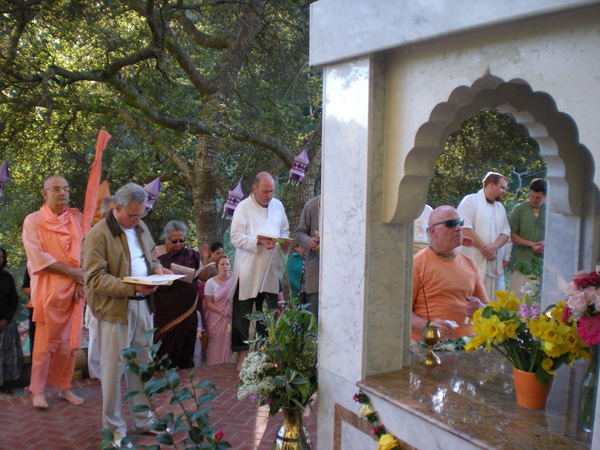 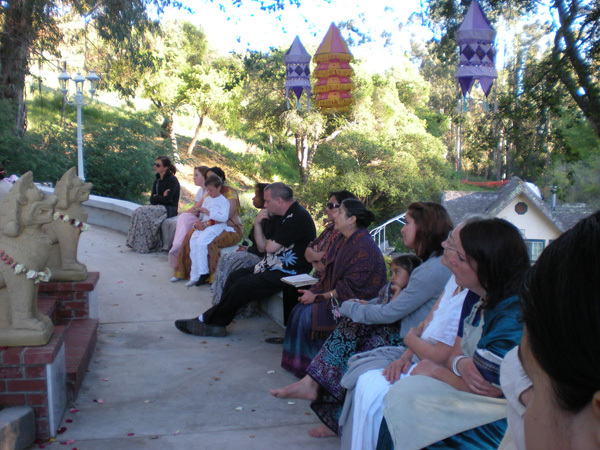 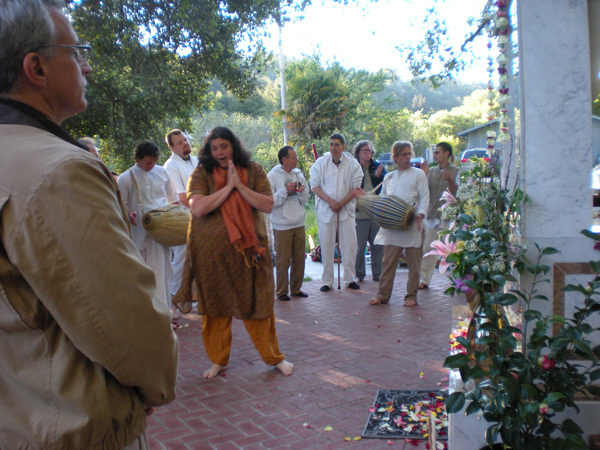 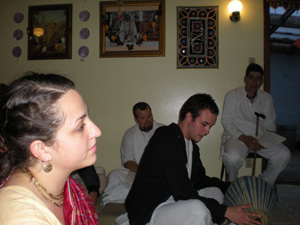 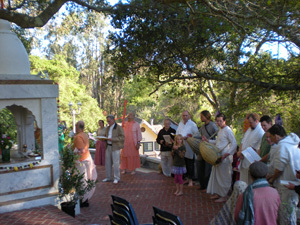 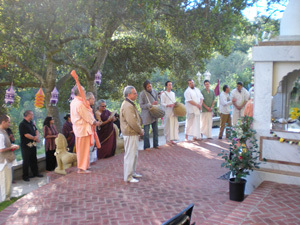 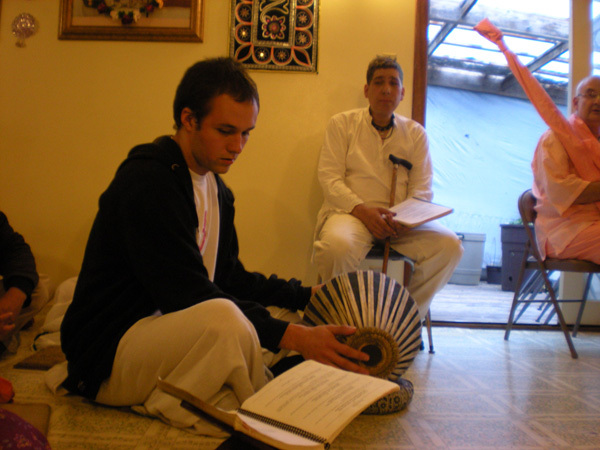 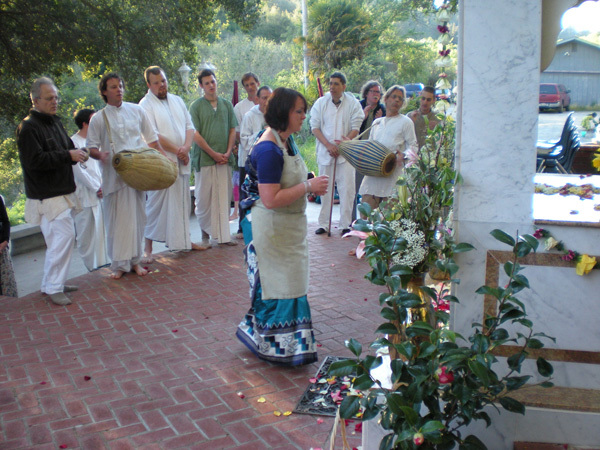 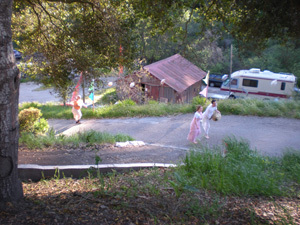 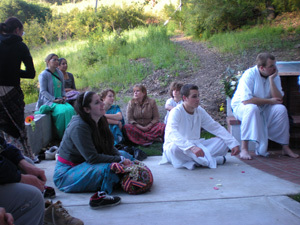 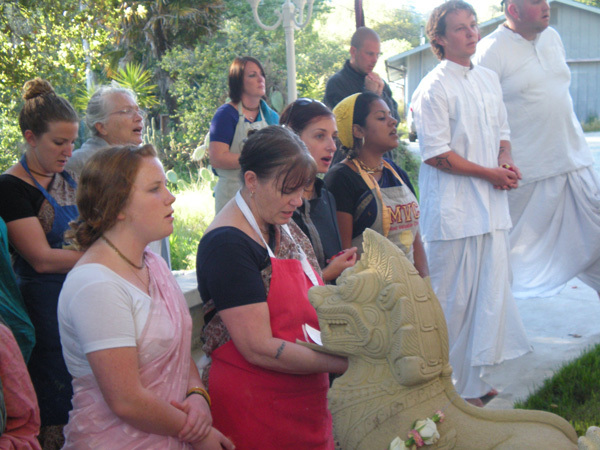 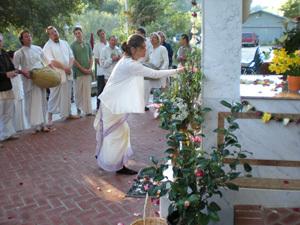 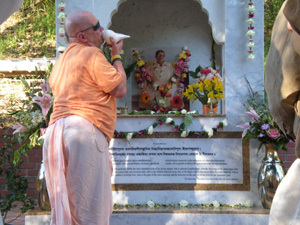 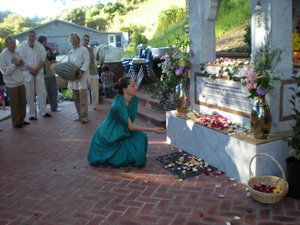 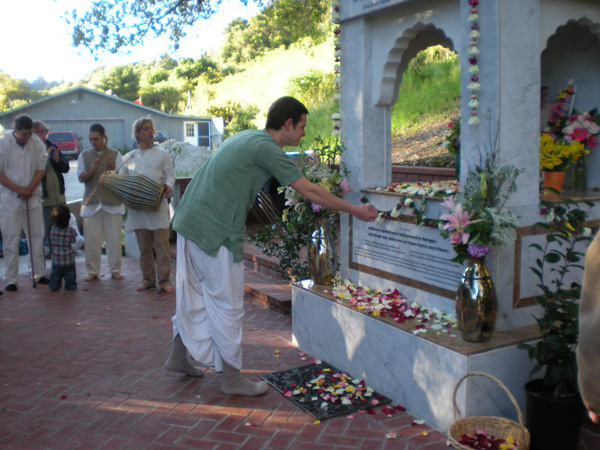 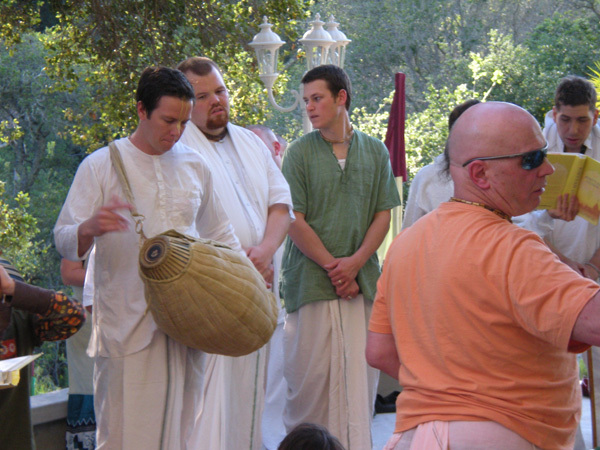 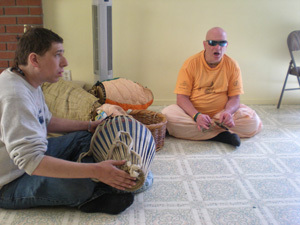 Kirtan begins as the devotees start gathering for Guru Puja. 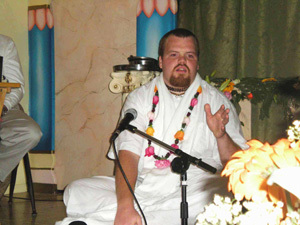 "sri bhakti sundara deva prabhu siromani"
"gosvami govinda jaya anandera khani"
"ajanu lambita bhuja divya kalevara"
"ananta pratibha bhara divya gunadhara"
"His graceful long hands touch his knees and his body is beautiful and transcendental. 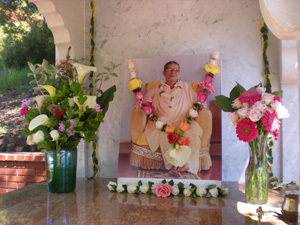 He is an ocean of infinite genius and transcendental qualities. who is our supreme master and is like a reservoir of joy." 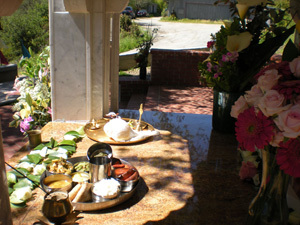 Pushpanjali, with folded hands the devotees come to offer flowers to the lotus feet of Sri Gurudev. 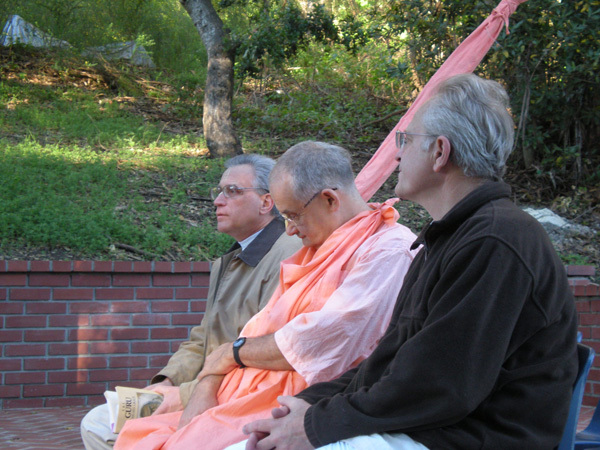 After Pushpanjali the devotees gathered to hear something about Srila Gurudev. 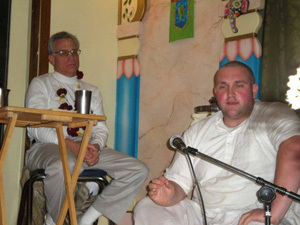 Sripad Hasyapriya Prabhu read from Sri Guru and His Grace giving a soothing balm to everyone's saddened hearts. 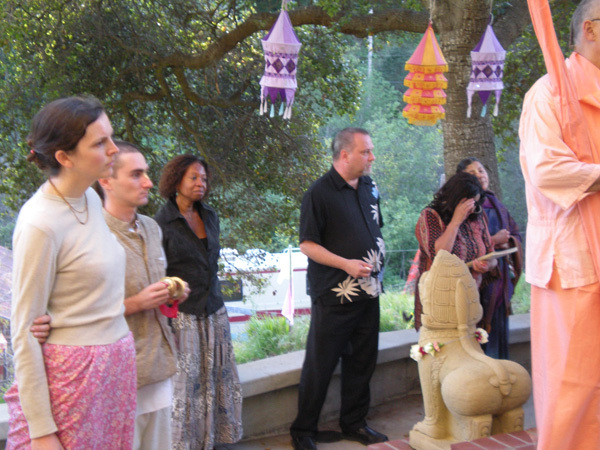 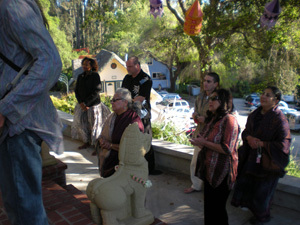 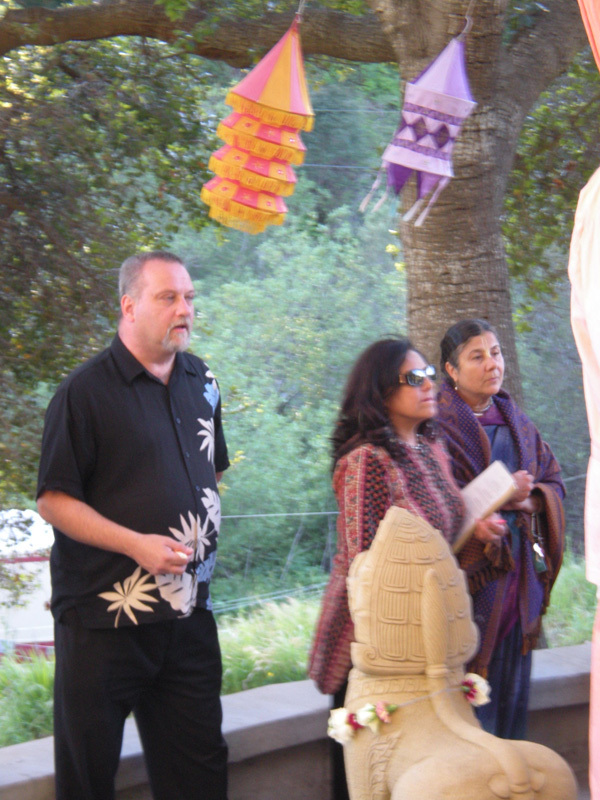 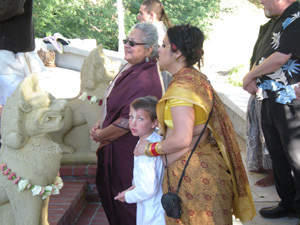 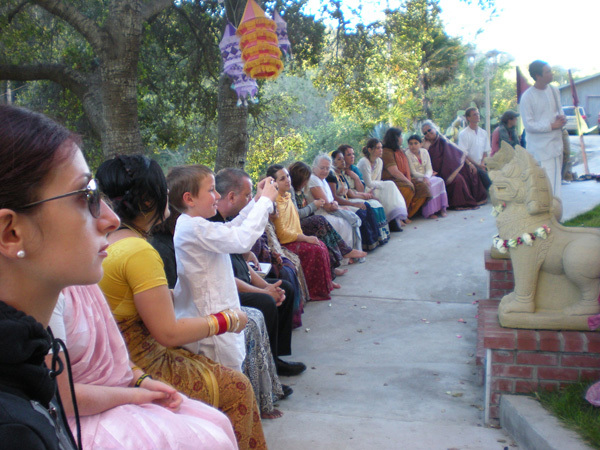 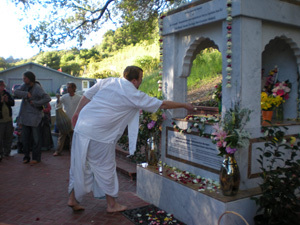 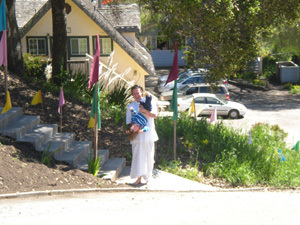 After the service at the Samadhi the devotees headed down to the Deity Mandir. 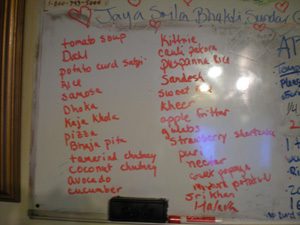 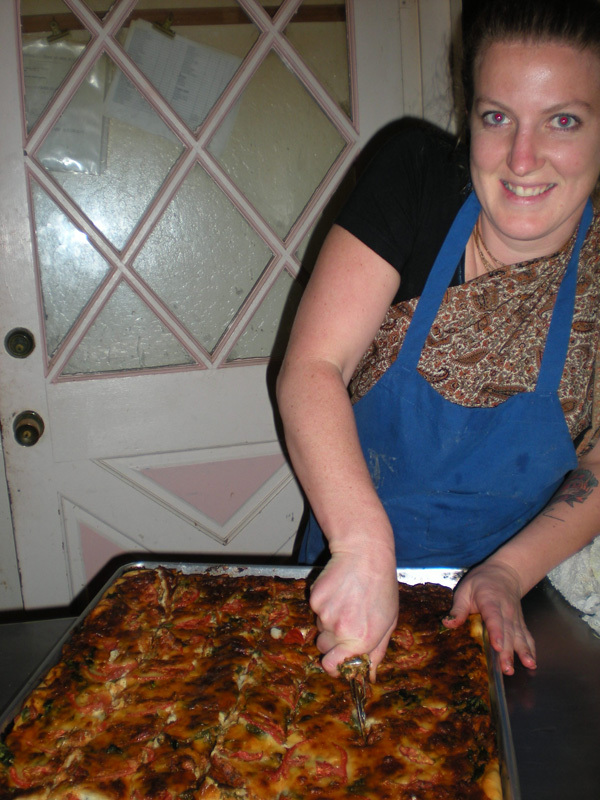 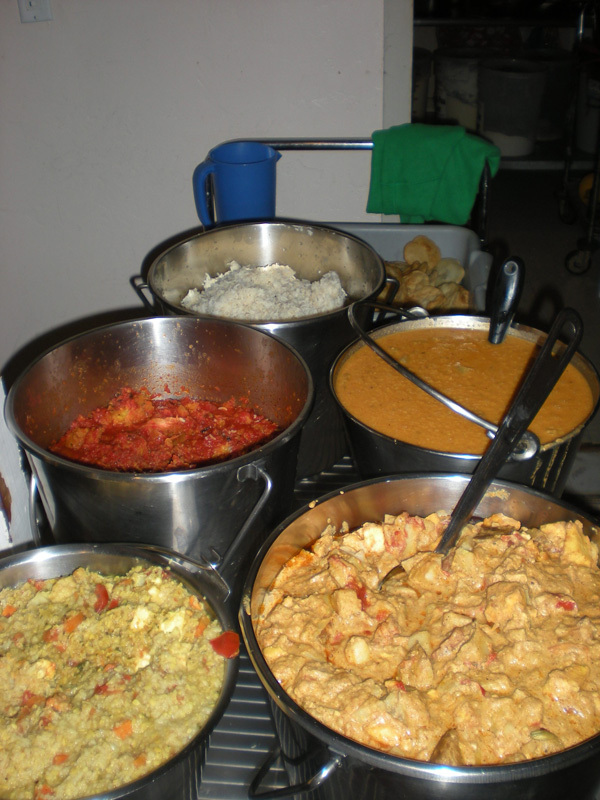 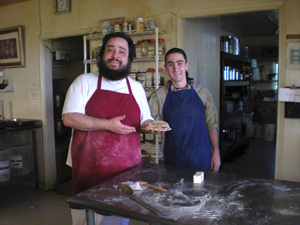 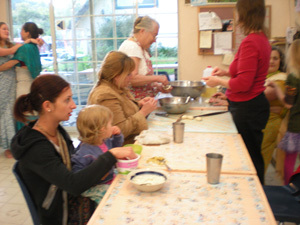 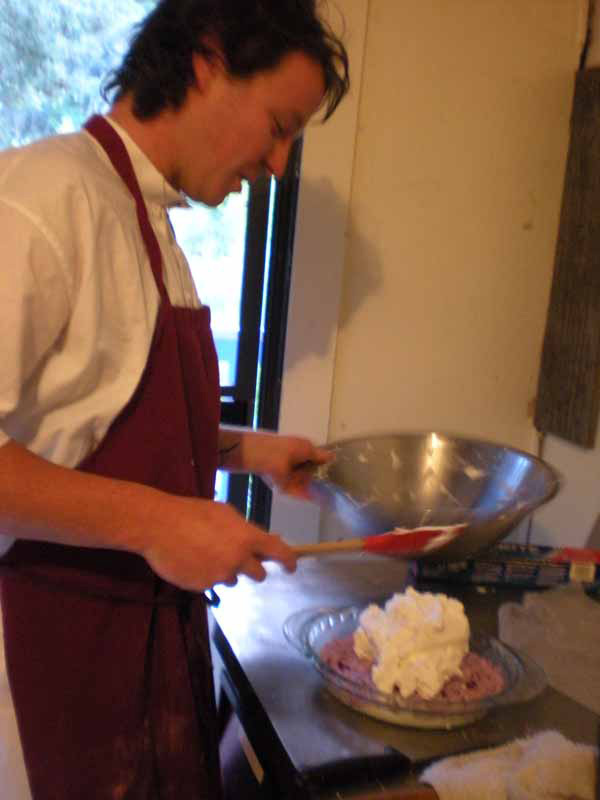 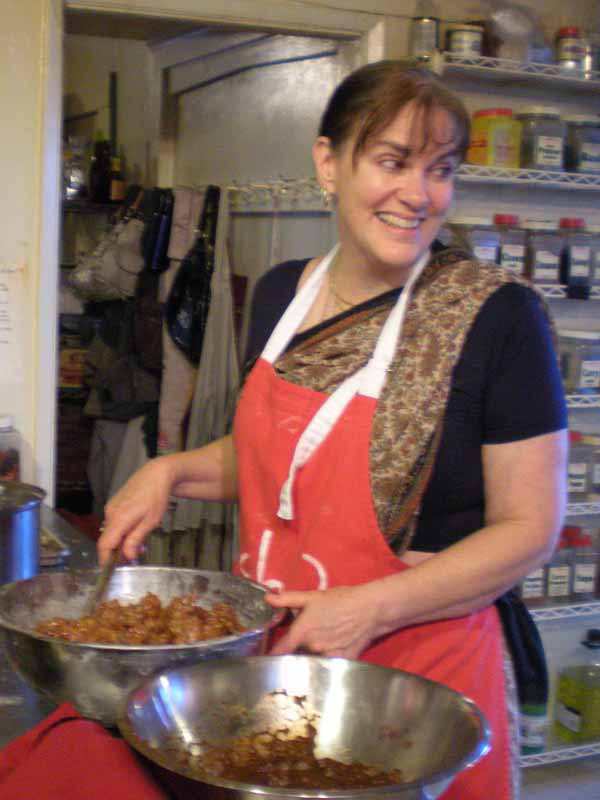 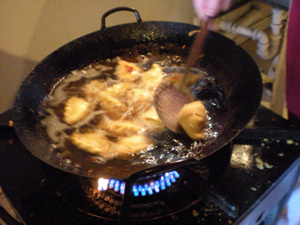 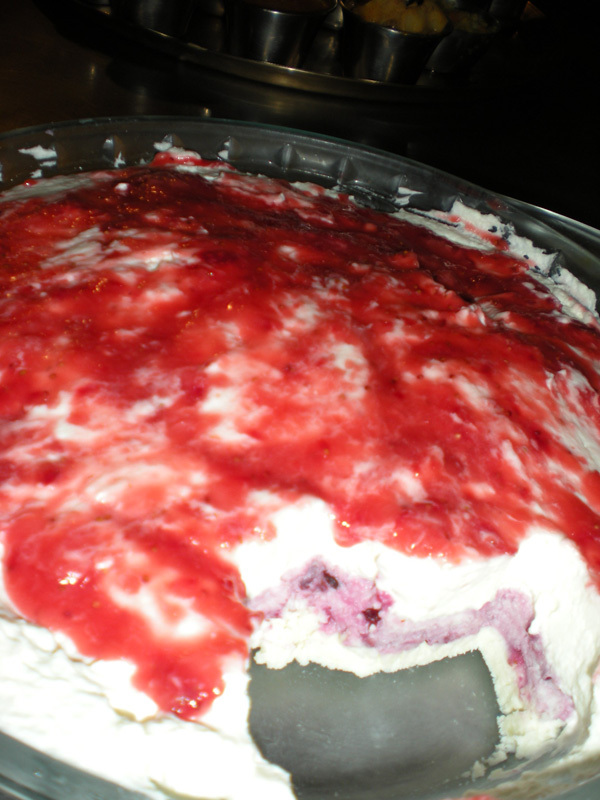 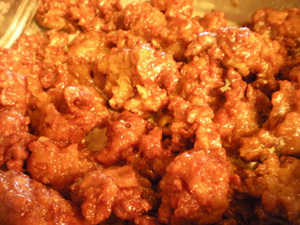 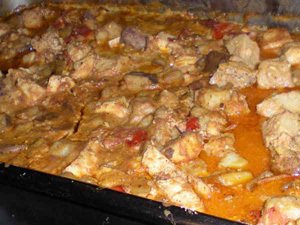 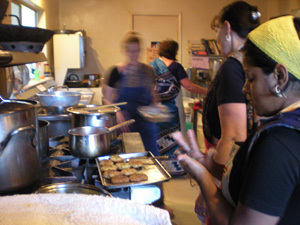 The kitchen was a buzz with our famous cooks making His Divine Grace's favorite foods. 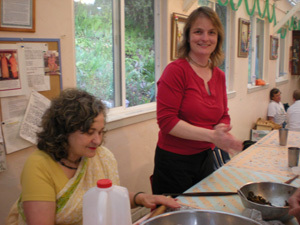 Srimati Sanatani Didi, our kitchen general. 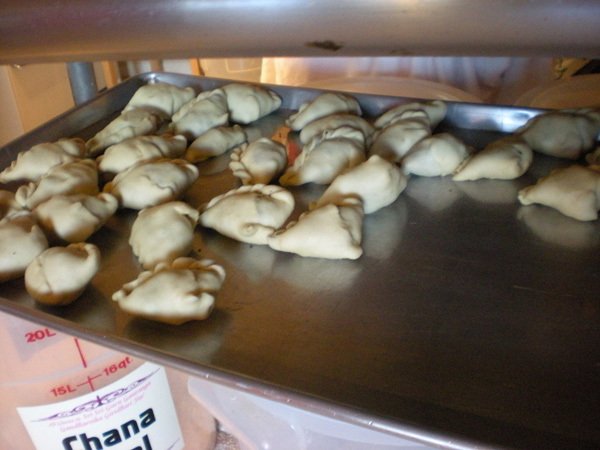 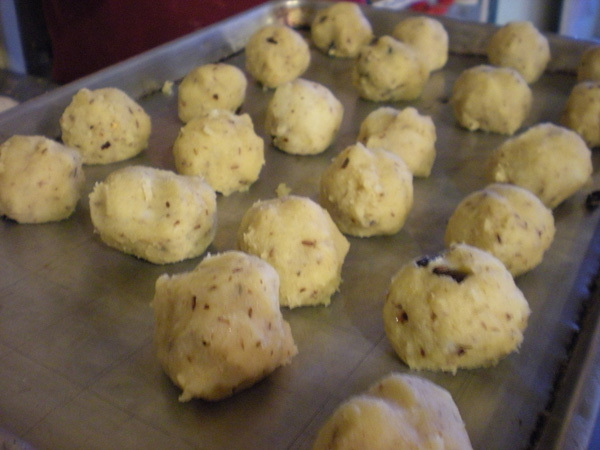 Shatrughna Prabhu making one of his incredible sandesh creations. 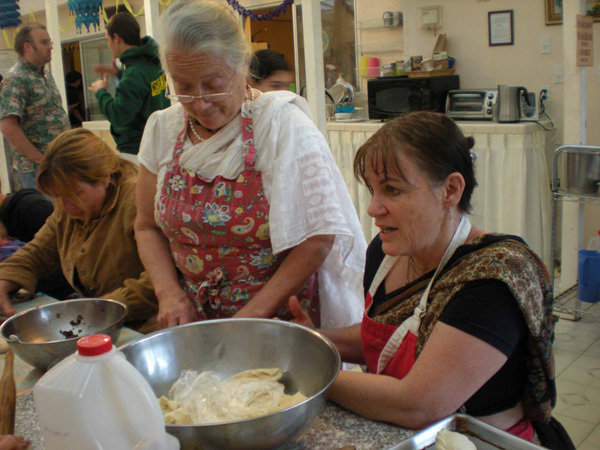 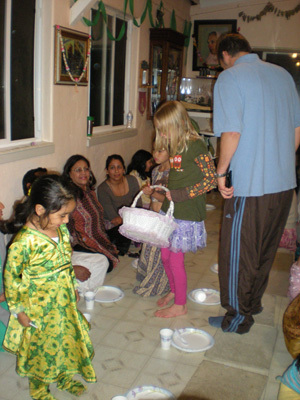 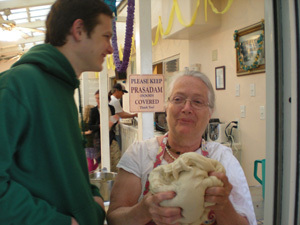 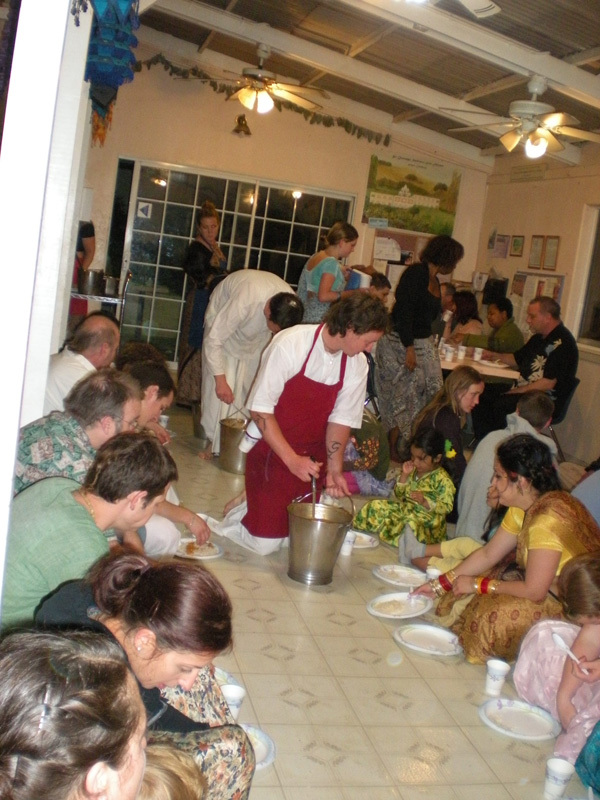 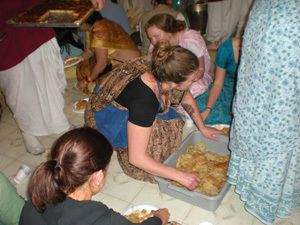 Many hands joined in the Prasadam preparations seva. 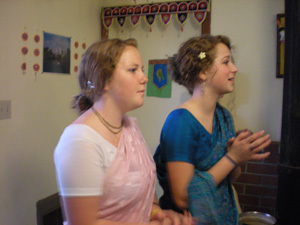 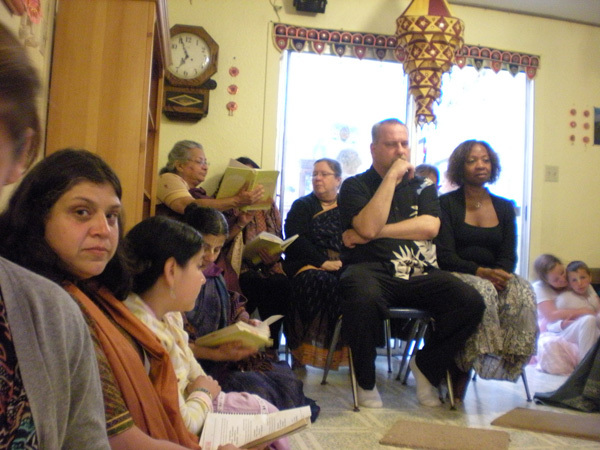 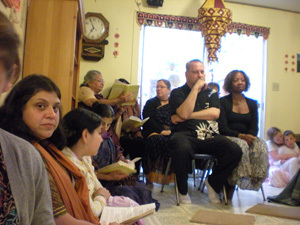 In the Temple room the devotees chanted many different songs to honor the day. The program was led by Sarva Bhavana Prabhu and also Sripad Parvat Maharaj shared his insights with everyone. 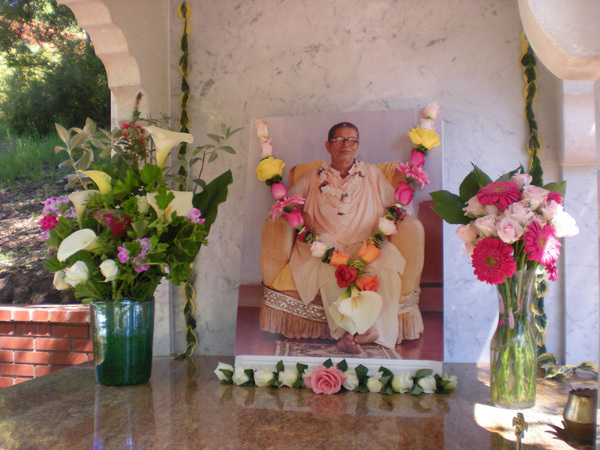 Srimati Sureshwari Didi shared her gratitude for all that Gurudev has given us especially this Ashram. 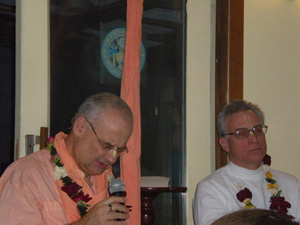 Vidura Krishna Prabhu joined the speakers enlivening everyone with his conviction. Ramachandra Prabhu back from India., spoke with a forceful enthusiasm filled with realization encouraging everyone to step up, " Gurudev has said everything, now it's time to do!" 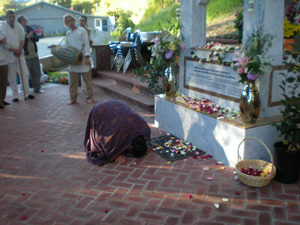 Vrinda Devi with full humility expressed her heartfelt appreciation. Sarva Bhavana Prabhu gave solid direction on how to focus on our service life expecially now. 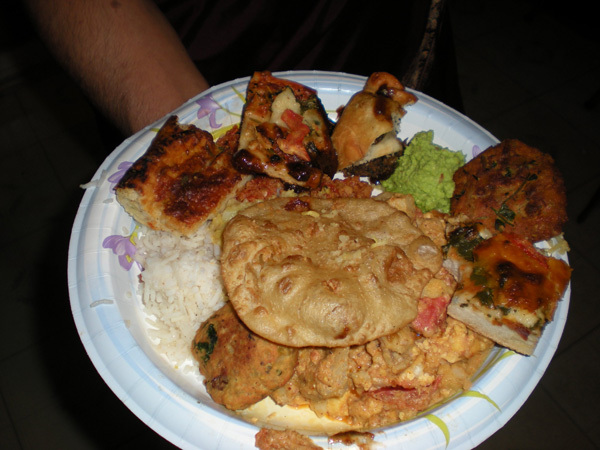 Their Lordships very full plates. 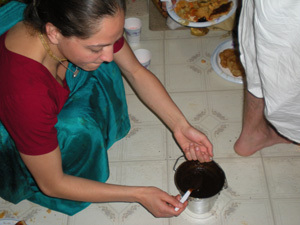 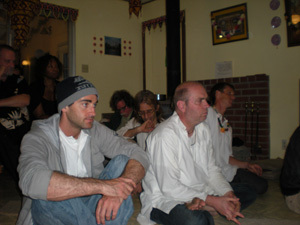 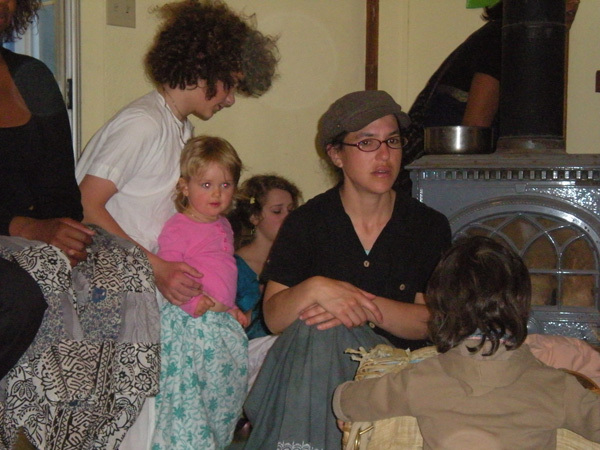 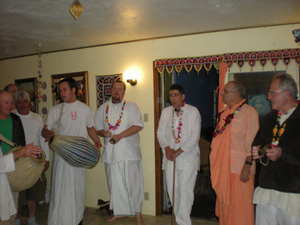 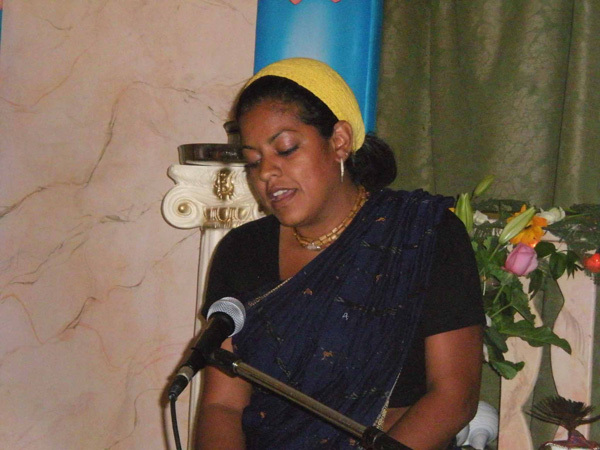 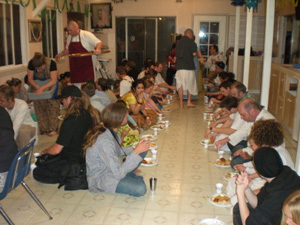 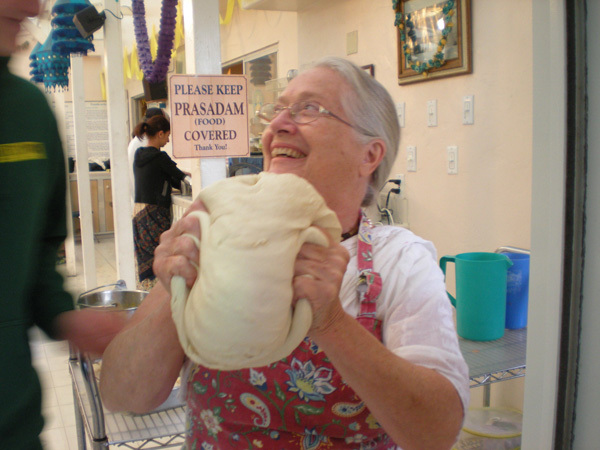 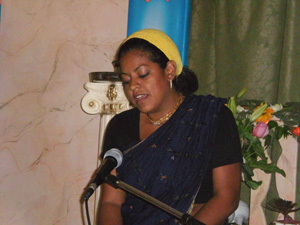 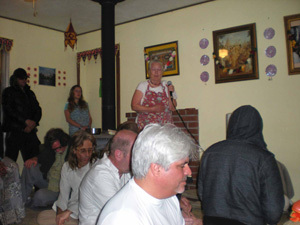 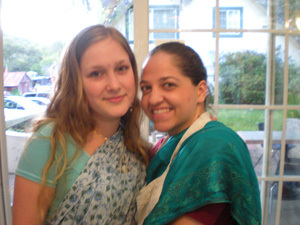 The program ended with kirtan, followed by Prasadam. 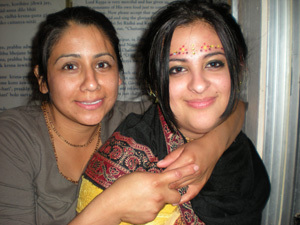 Shivani and Anjali take the donation basket. There were about a dozen servers. 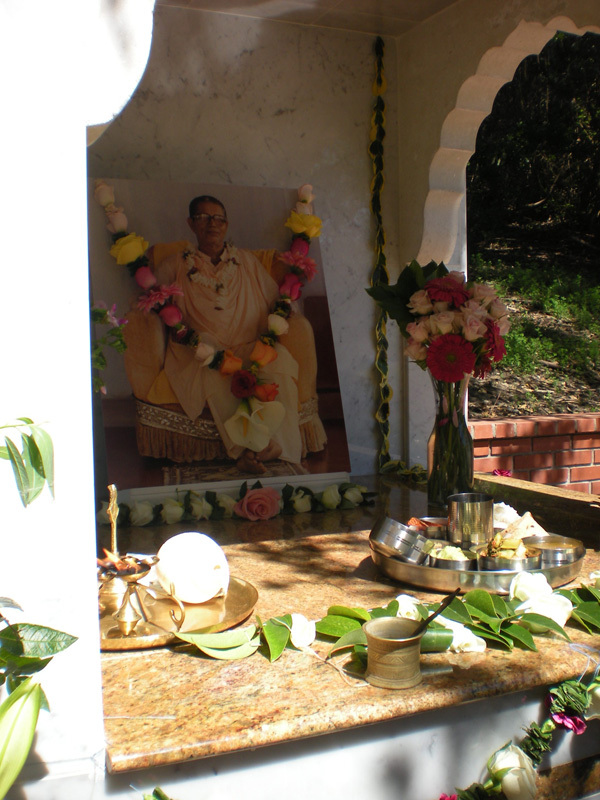 I worship the lotus feet of the Divine Master, who is the ocean of auspicious qualities. 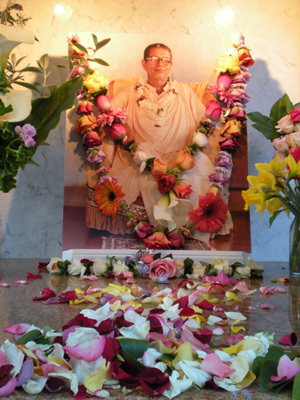 Just to deliver all planes of life that are suffering in the forest fire of the material world, he, as the rain-cloud of mercy, melts to shower down the waters of compassion.